There’s little denying that we’re living in uncertain times. 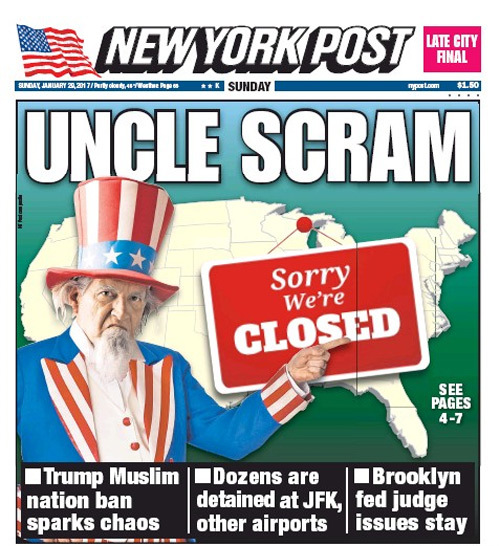 Just days ago, who would have predicted mass protests at U.S. airports or newspaper headlines suggesting America’s tourism industry is closed for business? Our industry, and in fact, the American economy as a whole, depends on robust international travel. International travelers spent $246.2 billion in the U.S. in 2015, supporting 1.2 million jobs. Putting this in perspective, travel to America supports more jobs than there are people in San Jose, California, the heart of Silicon Valley. For further comparison, a manufacturing giant like Ford Motor Company employs about 187,000 people in total, with a profit of $6.3 billion. International travel is not mere big business, it’s enormous business, comprising one-third of all U.S. service exports. So it should come as no surprise that travel professionals have been grappling with how the whole of Donald Trump—from his ethos, hospitality experience, and leadership to his many surrounding controversies—will affect the U.S. travel industry. To look into the matter for our anxious travel industry colleagues, we added a number of questions to our The State of the International TravelerTM survey, our annual study tracking traveler sentiment in 14 of America’s key international feeder markets across the globe. In early January, we surveyed a representative sample of 800 likely international travelers in each of these 14 countries, for a total of over 11,000 total surveys collected worldwide. As anticipated, the 2017 study (available now) yielded some very interesting insights into how international travel audiences feel about Mr. Trump. Feelings about America’s new leader can, of course, range from the very positive to the very negative. Overall, it appears that President Trump is more disliked than liked. Figure 1 (below) shows that about 43 percent of likely international travelers say his election has worsened, to some degree, their opinion of America. Only 16.3 percent reported that his ascension has improved their overall view of the country. Question – Did the results of the recent U.S. Presidential election change your overall opinion of the United States of America? If so, how? (Please select the answer that best fills in the blank below) As a result of the election, my overall opinion of the United States is _________. Nevertheless, this sentiment is far from equal across countries. 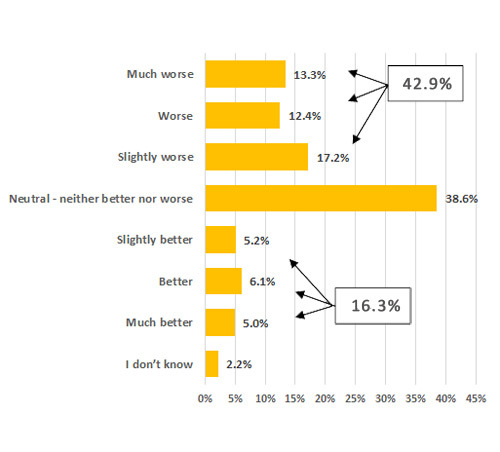 For this same question, Figure 2 (below) illustrates what researchers call the Bottom 2 and Top 2 box scores, or the proportion of survey respondents saying the election has made them feel “Worse” or “Much worse” or “Better” or “Much better” about America. Countries with a net improvement—where the percent of international travelers’ whose opinions of America improved as a result of the election is greater than the percent whose opinions of America worsened—include Brazil, China and, most notably, India. India’s net opinion changed significantly, with 44.1 percent rating their opinion of America as “Better” or “Much better” post-election. 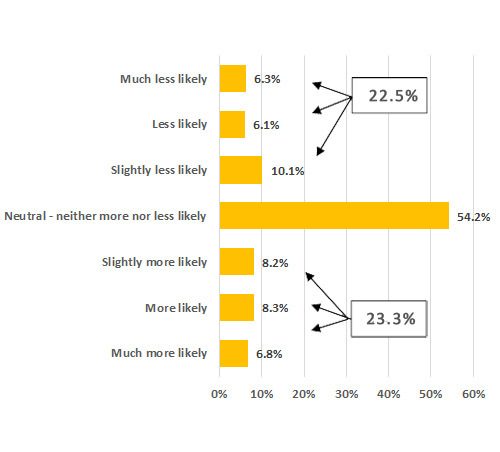 However, as seen in the chart at the right of Figure 2, the majority of countries studied have a declined opinion. Residents of some of our country’s largest international travel markets—i.e. Canada, Mexico and the UK—reported “Worse” and “Much worse” opinions about America as a result of the recent presidential election. This is not good news for our industry, but then the question remains, does the lower overall opinion translate to decreased likelihood to visit America? Figure 3 below offers insight. Question — How have the results of the U.S. Presidential election effected the likelihood you will visit the United States in the NEXT FIVE (5) YEARS? (Select the answer that best fills in the blank below) I am ____________ to visit the United States in the NEXT FIVE (5) YEARS. Even though the overall impact may be relatively muted, again there are large differences by country. There is a larger net number of international travelers in India, Brazil, and China who indicate that they are more likely to visit because of the election results than less likely. These countries have become prominent international travel players as their economies have developed over the past fifteen years. The combined visitation of India, China and Brazil makes up 7.6 percent of all international travel to the U.S. Thus, as a result of the election, we may potentially experience continued, or even slightly higher, increases in visitation from these markets. On the other hand, Mexico, Germany, Holland and Canada indicate that they are net less likely to travel to the U.S. because of the election results. The unfortunate reality we face with this finding is that Canada and Mexico are our nation’s greatest sources of international travel volume and spending. Combined, visitation from these two important countries account for half of all international travel to the U.S. The different national perspectives on President Trump amongst international travelers are striking. 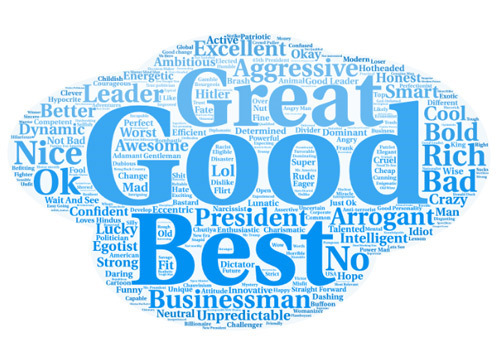 To dig a little deeper, we asked international travelers in these 14 countries, “What one word best describes Donald Trump?” With this, we hoped to gain a broader sense of how each country viewed the 45th President of the United States. Comparing two countries reporting the greatest impact by the Trump election, India and Mexico, vividly illuminates the differences in perceptions across markets. The word cloud below summarizes responses written in by Indian travelers. 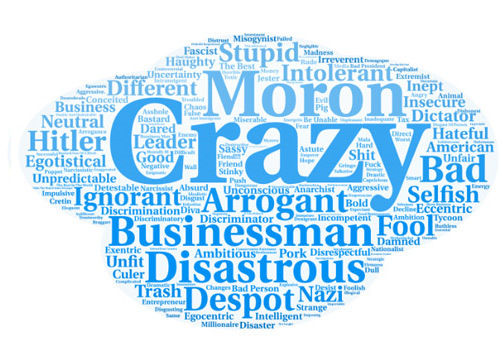 Question – What one word best describes Donald Trump? Amid all the controversial news and executive orders flying around, it may be difficult to easily understand why Indian travelers have such positive feelings about President Trump. In India, it appears that the Trump brand is primarily associated with luxury. The brand is a glitzy, golden, rich business that offers prestige and the appearance of wealth. Trump Towers Mumbai, is expected to open next year with 300 apartments available to purchase. Its apartments are reportedly selling at a 30 percent premium over other apartments in the area. Indians may also see similarities between Trump’s election and their own Prime Minister. Both ran on platforms of being an outsider to the political dynamic and ability to take charge and get things done. Additionally, India is largely untouched by Trump’s well-publicized ire, which seems mostly directed at Mexico, China and the Middle East. While India, for the most part, views Trump positively, it’s no surprise that our neighbor to the south rates him differently. The word cloud below illustrates Mexican sentiment. President Trump’s relationship with Mexico is well documented and hardly needs repeating—and the word cloud above very clearly and directly describes the nation’s sentiment. One man, two countries, and their opinions of him are like night and day. The overall impact of President Trump’s actions is yet to be seen. However, as evidenced by the response to President Trump’s recent travel ban, it is likely to be pronounced and uneven across international markets. Destination Analysts’ eye is firmly on this for the industry, and we will share with you what we learn from travelers as this presidency progresses. Americans are Ready to Travel Health & Wellness Travel. A Cure to the Always-on Lifestyle?